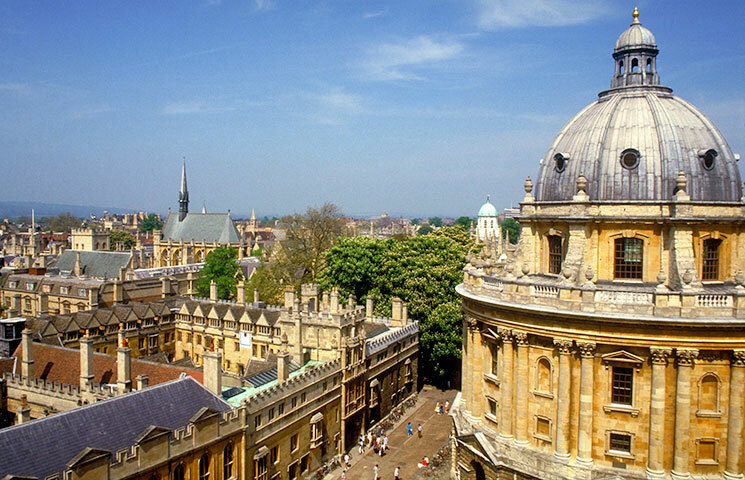 Think of Oxford and you’ll almost certainly conjure up romantic images of dreaming spires and busy students on bicycles, college scarves trailing behind them in the breeze. It is one of the country’s most famous historic institutions and, for many, the very epitome of Britishness. 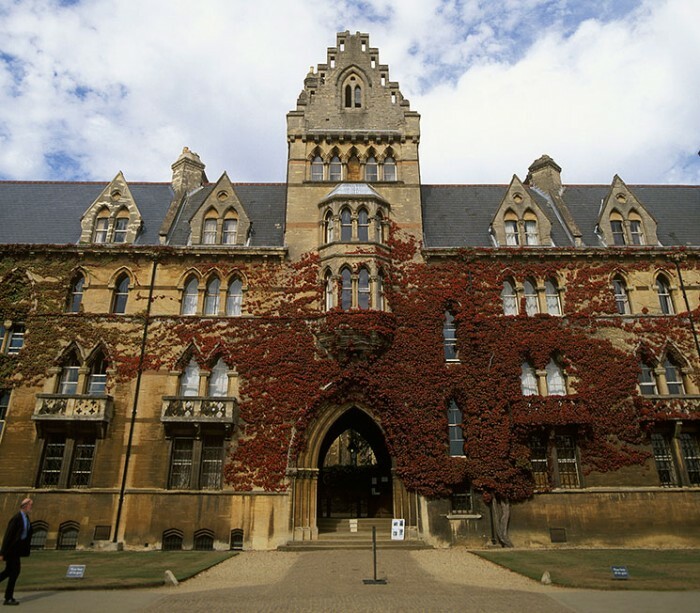 While having no known formal date of foundation, there is evidence of teaching at Oxford as far back as 1096, making the University of Oxford the oldest university in the English-speaking world and the world’s second-oldest surviving university. It grew rapidly after 1167, when Henry II banned English students from attending the University of Paris, and the university was granted a royal charter in 1248. The oldest colleges are University College, Balliol, and Merton, established between 1249 and 1264. Christ Church was traditionally considered the most aristocratic college. It began life in 1525 when, at the height of his power, Thomas Wolsey suppressed the Priory of St Frideswide in Oxford and founded Cardinal College on its lands. As he was wont to do, Wolsey planned the establishment on a magnificent scale. However, he famously fell from grace in 1529, and the buildings remained incomplete for another 140 years. Major additions have been made to the buildings through the centuries, and Wolsey’s Great Quadrangle was crowned with the famous gate-tower designed by Sir Christopher Wren. If the college looks more than a little familiar, there’s a good reason. It’s had plenty of screen time over the years featuring in an adaptation of Evelyn Waugh’s Brideshead Revisited and the Harry Potter films, among other appearances. The beautiful Radcliffe Camera houses the Radcliffe Science Library and is one of the city’s most iconic landmarks. Designed by James Gibbs in neo-classical style and built in 1737-49, the library’s construction and maintenance was funded from the estate of John Radcliffe, a notable doctor, who left £40,000 upon his death in 1714, although library didn’t open until 1749. It sits alongside Brasenose College, officially The King’s Hall and College of Brasenose, whose history stretches back to 1509 when the college was founded on the site of Brasenose Hall. The college library and current chapel were added in the mid-17th century. St John’s, founded in 1555 by the merchant Sir Thomas White, is built around seven quadrangles. 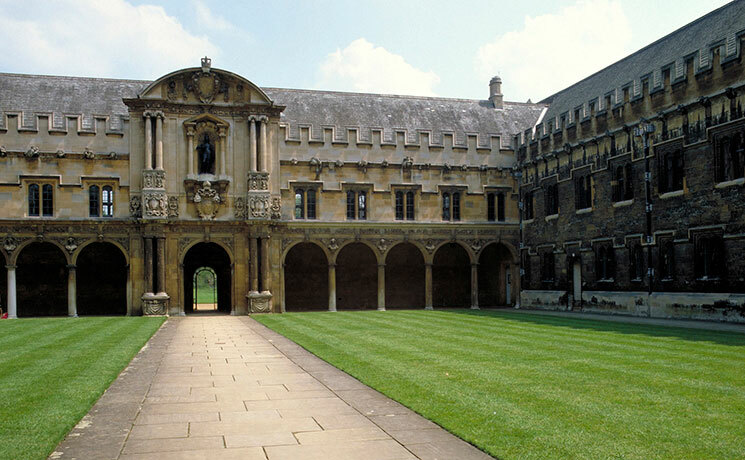 The Canterbury quad (pictured above), substantially commissioned by Archbishop Laud and completed in 1636, is the first example of Italian Renaissance architecture in Oxford. The Hertford College began life as Hart Hall, a small tenement built roughly where the college’s Old Hall is today. Richard Newton, who became Hart Hall’s principal in 1710, built up the college, freeing it from debt and funding new buildings. A charter incorporating ‘the Principal and Fellows of Hertford College’ was issued in 1740. 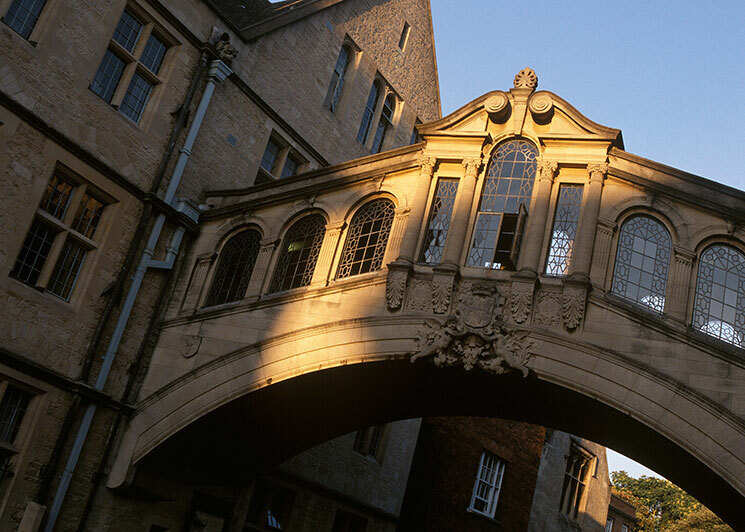 Hertford Bridge, popularly known as the Bridge of Sighs, is a skyway joining two parts of Hertford College over New College Lane. It is one of the city’s most famous and most photographed sights. Much of its current architecture was designed by Sir Thomas Jackson and it was completed in 1914.